Hope Street Missions Uganda is the result of a prayer offered a number of years ago by Holly Suber which simply said, “LORD, give me a passion for something with eternal significance.” As an artist, Holly had a strong sense that somehow there was going to be a connection between her art and Uganda, a country she had visited and loved. Oddly enough, she found herself wanting to do paintings of people’s shoes as a type of portrait. This leading didn’t seem to make sense to her, but she knew there was something significant about it. From time to time Holly would think about the shoe idea and laugh with herself over its seeming silliness. However, while in Uganda on a mission trip with her church, God brought all the pieces together . The little boots belonged to a six year old boy named Ronald. After much negotiation, Holly was able to exchange Ronald’s boots for a new pair. Once back in America, she knew she had to first draw Ronald’s shoes before she could paint them. 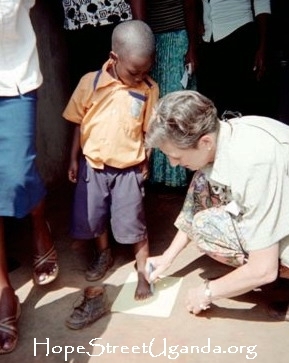 The first pencil drawing has become the logo for Hope Street Missions Uganda. God answered Holly’s prayer and today many people in Uganda are being helped through her Art of Caring.